Athens, Pa. – An eight-year-old boy is bringing business back to Athens after the flood—by running his own Italian ice stand.The September flooding knocked out dozens of businesses in Athens. One of them was an ice cream shop in Teaoga Square Park. So Jack Henry Barrett, 8, brought an Italian ice stand in to replace it. 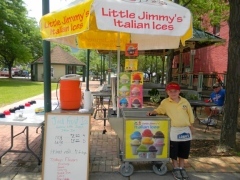 Jack is the official owner of Jack Frost Ice, featuring Little Jimmy’s Italian Ice. He works there with his dutiful employees, his parents. The stand features four flavors that change daily. Customers in the square for a concert Thursday night say Jack is a sign of new life in Athens. The Barrett family purchased the Little Jimmy’s stand and got approval from Athens Borough, which owns the park. Jack opened his stand two weeks ago, and his dad says he’s already inspired some other local kids to start their own businesses and help Athens recover. Bringing smiles back to Athens, one scoop at a time. That’s the business plan of eight-year-old Jack Henry Barrett, who opened up an Italian ice cart in Teaoga Square in Athens Borough last week with the help of his father, Ed Barrett Jr.
Jack Frost Ice, which features Little Jimmy’s Italian ice products, came about after the Barretts – including Jack’s mother Deanna, who owns the nearby Urban Connection salon – wanted to find another way to bring people back to the recovering business district hit hard by flooding in September. It seems to be working, Ed Barrett said. “So far, it’s been a great response,” he said, adding that the business already has “a lot of repeat customers in such a short time” since the stand opened for business last Wednesday. Jack “has been a businessman since he could count change,” Barrett said. With the help of his father, family friend Mary Johnston and other adults, Jack scoops the ice, stocks supplies and keeps the stand clean. The Barretts decided to purchase a Little Jimmy’s italian ice cart because of its low overhead and to fill a need left open this summer with the fate of nearby D and R Ice Cream in question after the flood, Barrett said. The Athens borough council granted the Barretts permission to serve the frozen treats in the square last week. The stand will be open from noon to 8 p.m. Monday through Saturday, weather permitting, Barrett said. The Barretts plan to serve ice during the square’s special events, including the borough’s special concert series. The cart may also travel to other locations, such as the farmer’s market held on Fridays in Howard Elmer Park in Sayre, Barrett said. 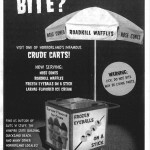 The cart can hold four flavors at a time, Barrett said, with the varieties changing daily. The stand also sells a selection of miniature Major League Baseball team helmets that can be refilled with ice throughout the season at a discount, he said. Flavors range from the traditional – blueberry, cherry, chocolate – to fruit flavors, bubble gum and root beer. “There’s a flavor for everyone,” Barrett said. Here’s the video of Jack also! Review Photo/Amanda Renko Jack Henry Barrett, 8, is operating Jack Frost Ice in Athens’ Teaoga Square with the help of his father, Ed Barrett Jr. Sporting events attract loads of fans who love to watch the game while enjoying Little Jimmy’s Italian Ices. Make arrangements to have one of our Italian Ice pushcarts or trucks at your next game – baseball, soccer, football, volleyball, polo, rugby, etc. We can arrange to have a Little Jimmy’s Italian Ice pushcart or truck at your next Fundraiser or Party. Fundraisers – Organizational, Church and School Parties – Birthday, Reunions, Picnics, Weddings, Pool Parties. Contact us to arrange to have Little Jimmy’s Italian Ices at your next event. A representative will call you back with all the details. You can E-Register, and get yourself into business! Welcome to Little Jimmy’s Italian Ices Blog- This is our first post! This will be a starting point to introduce myself and my fellow co-workers, my mom, dad and brothers in our natural environment, that is, a family business. My dad- Harry Moore (maiden name Harry Moore) was born in 1940 in Hazelton, PA (home of Jack Palance Oscar-winning actor) purchased the company from his father (Albert Moore, founder of Little Jimmy’s) in 1971. Jeffrey Moore- second oldest brother is Chief Manufacturer of Little Jimmy’s Italian Ices and ardent Yankee fan. Tom Moore – third oldest or second youngest, is a happy pug owner and a viral video fan. Anthony Moore- youngest of the Moore clan, recently returned from Florida to help out with our growing business. Dennis Moore (me), graduated Albright College in English Communications in 1985, is the proud dad of twins (one of each), and major movie and music enthusiast.